Tribology, the study of the friction and wear of materials, comes from the Greek word, tríbein, meaning to rub. The first tribological coating for controlling friction and wear was titanium carbide (TiC), introduced in 1969 on cemented carbide cutting tool inserts using chemical vapor deposition (CVD). The problem with the CVD process was that the substrate temperature during deposition was about 1000ºC so that CVD could not be used to coat high speed steel tooling, which is softened at those temperatures. To overcome this obstacle, workers began using physical vapor deposition (PVD) techniques that provide ion bombardment of the growing film, resulting in good film adhesion and densification of the film. 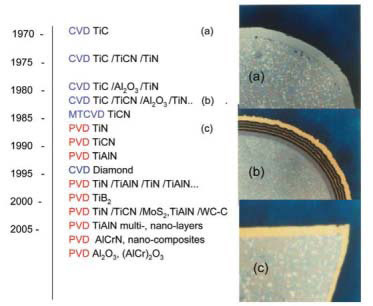 The first commercially successful PVD hard coating was titanium nitride (TiN). Balzers deposited it with their low voltage electron beam process, Ulvac with their hot hollow cathode process, and Multi-Arc with their cathodic arc process. Since the cost of the arc coating equipment was less than that of competing deposition processes, the cost of the arc coatings was lower, and the use of cathodic arc deposited hard coatings became widespread. Initially, sputtering was not used for the commercial deposition of the tribological films because the quality of the films did not equal that of films produced by low voltage electron beam or cathodic arc methods. This situation was significantly improved with the introduction of closed-field unbalanced magnetron sputtering that provided for a higher degree of substrate ion bombardment during deposition. One of the early themes in PVD tribological coatings was that high hardness was the most important property. It is true that a coating used for a machining application must be hard, but it is now understood that a coating should be both hard and ductile if it is going to perform well in a tribological application. Superlattice, multilayer, nanostructured, MAX phase, and carbon nitride (a form of diamond-like-carbon (DLC) film) coatings have succeeded in achieving a measure of success in providing both hardness and ductility. Many DLC films are produced by PVD techniques including cathodic arc, filtered cathodic arc, sputtering, reactive sputtering, and low pressure CVD, and plasma assisted or plasma enhanced CVD processes. The hardness of DLC films covers the range from hard to superhard with hardness of 20-80 GPa. Whereas hard coatings such as titanium nitride, titanium aluminum nitride, and multilayer films have been used very successfully for tooling applications, the DLC films have been very successful where low friction and low wear are needed such as on gears and bearings. There are two areas that will be very important for the future of tribological coatings. The first of these is nanolayered and nanocomposite coatings, which have already had a major impact on tribological coatings. Another area that should have a major impact on tribological coatings is the use of ionized PVD. Here the recent introduction of high power pulse magnetron sputtering (HPPMS) is used to provide a high degree of ionization of the sputtered material, improving the quality of the coatings and allowing the deposition of films that previously could not be done with conventional sputtering.